You know you’re in for a treat the moment they open the briefcase. Inside the specially molded case is where Aaron Bergh and Luke Beaton, the minds behind Calivore Spirits, keep product that they are ready to sell. There is a blonde rum and a spiced rum, and both feature nature-inspired artwork that looks as though it’s been hand drawn directly on the label. As I sample the blonde, Bergh tells me that it’s made with used wine barrels, and I can taste the hints of wine perfectly blended in with the rum flavor. BRAND NEW: (From left to right) Raleigh NeJame stands next to Calivore Spirits’ Aaron Bergh and Luke Beaton, who launched a new line of locally-made rum at Sidecar in SLO on June 26. 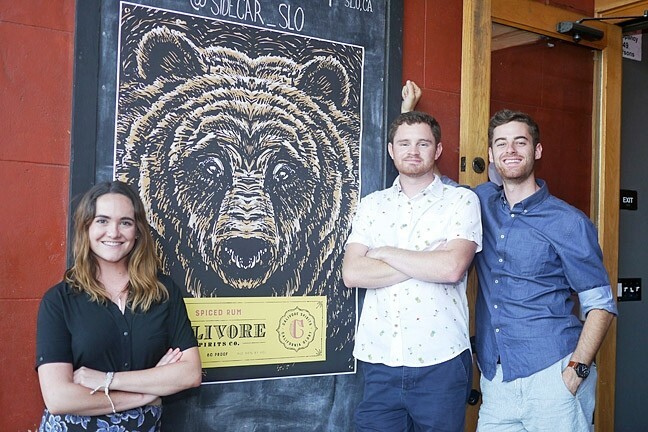 Bergh started Calivore Spirits through the Cal Poly Center for Innovation and Entrepreneurs (CIE) while he was studying as a crop science major and viticulture minor. He describes CIE as “kind of like Shark Tank for Cal Poly students” and said that the process for legitimizing his business was very intimidating. CIE supports student start-ups in two ways: First, there is a competition called Innovation Quest, in which the top three winners receive cash prizes to fund their projects. For those who do not win, the second option is to try for a spot in the SLO HotHouse, a place downtown that hosts and helps to grow local start-ups. Although Calivore Spirits was a finalist in this year’s Innovation Quest, it did not win any of the cash prizes. Fortunately, Bergh’s second attempt at gaining CIE’s support was successful, and Calivore Spirits has made its home in the HotHouse, where it stands out from the other companies present by sporting its name on a large yellow banner over its corner of the room. With an address at the HotHouse, wine barrels donated by Mike Sinor, and artistic bottles created by Kraftwerk Design, Calivore Spirits has obviously come a long way since its humble days as Bergh’s homebrew. Luckily for the rest of us, you no longer have to be Bergh’s neighbor in order to get a taste. Both the blonde rum and the spiced rum are now for sale at The Granada Hotel and Sidecar Cocktail Co., with more local bars hopefully to be added to that list soon. Find the rum maker at calivorespirits.com or on Facebook @CalivoreSpirits. • The California Women for Agriculture San Luis Obispo County Chapter awarded 25 local youth more than $10,000 in scholarship money this year to assist students with college fees and their 4-H and FFA animal projects in preparation for the annual Mid-State Fair. The nonprofit’s primary fundraiser for the scholarship program is the annual Burgers & Brews Festival and Competition, which is set for Sept. 4 at the Loading Chute in Creston. Tickets go on sale July 1 at burgersandbrews2016.brownpapertickets.com/. New Times Intern Katrina Borges wrote this week’s Strokes & Plugs. Send hot tips to strokes@newtimesslo.com.